Oxygen exists in air to an extent of 21% by volume (or 23% by weight). It is the most abundant element on earth, accounting for ½ the total mass of the earth’s crust. Oxygen is mainly found in combined states as oxides, hydroxides, silicates, sulphates, carbonates, water, etc. Its ease of combination with other elements to form compounds shows that oxygen is a very reactive element. Oxygen can be prepared in the laboratory from either hydrogen peroxide solution or potassium chlorate salt. The most common method for the preparation of oxygen in the laboratory is by decomposition of hydrogen peroxide solution. The gas is prepared by catalysing the decomposition of hydrogen peroxide with manganese (IV) oxide. At room temperature hydrogen peroxide decomposes (breaks down) very slowly. It decomposes to water and oxygen. To speed up the decomposition process, and hence collect substantial amount of oxygen gas within a short time, black manganese (IV) oxide is added as a catalyst. A catalyst is a substance that, although present in small quantities, will alter the rate of a chemical reaction but will remain chemically unchanged at the end of the reaction. Hydrogen peroxide (20 vol.) is added drop by drop to manganese (IV) oxide, which catalyses the decomposition of the peroxide. Oxygen is collected over water as shown in figure bellow. The gas is collected by downward displacement of water because it is only slightly soluble in water. A grinded mixture of potassium chlorate and manganese (IV) oxide, at a ratio of 4:1, is placed in hard glass tube and fitted up as shown in figure bellow. The mixture is then heated and oxygen gas is readily given off. The gas is collected over water. Oxygen has almost the same density as air, so it cannot be collected by the upward displacement of air. It is possible to collect it by downward displacement of water as shown in the figure because it is only slightly soluble in water. 1. Oxygen has no smell but dinitrogen oxide has a sweet, sickly smell. 2. When heated with nitrogen monoxide, oxygen produces brown fumes of nitrogen dioxide. Dinitrogen oxide has no effect on nitrogen monoxide. The manner in which oxygen reacts with metals is summarized in the list below. When burnt in excess of oxygen, sodium burns with an intense yellow flame to give sodium peroxide. The product is a yellow solid which dissolves in water to give an alkaline solution. In general, metals react with oxygen to form basic oxides. Phosphorus bursts into flame in air or oxygen, without being heated (that is why it is stored under water). A white solid, phosphorus pentoxide is formed. It is a clear, colourless gas with no smell. It is slightly soluble in water (100 cm3 of water at room temperature dissolves about 4 cm3 of oxygen). It has almost the same density as water although slightly denser than air. 5. It boils at -183ºC and freezes at -218ºC. It is a very strong oxidizing agent. Oxygen is very reactive. It reacts vigorously with a great many metals and non-metals to form basic and acidic oxides respectively. 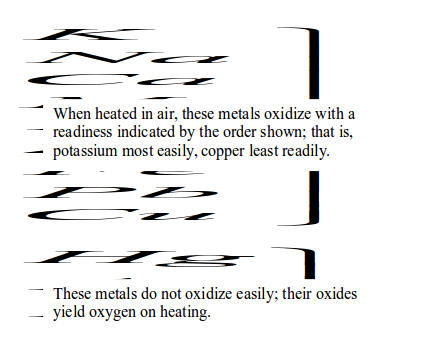 Metal + Oxygen gives metallic oxide (most of these are basic in character). Non-metals + Oxygen gives non–metallic oxide (most of these are acidic in character). The oxygen in the air and that dissolved in water and soil is used by all respiring organisms. Also all types of burning need oxygen. It is used in the oxyacetylene (oxygen–ethyne) flame for welding and cutting steel. It is extensively used for removing impurities from pig iron in order to produce steel. Oxygen is blown into molten iron to remove impurities such as carbon or phosphorus, which are expelled in the form of gases, i.e. their oxides. Oxygen is used as an aid to breathing in hospitals, high altitude climbing or flying, and in deep sea diving. Liquid oxygen is used in the burning of fuels such as kerosene, hydrogen and hydrazine used in various types of rockets. It is used in the L-D process for making steel. There is relationship between uses of hydrogen and its properties. For example, oxygen is used as an aid to breathing in hospitals and at extreme altitudes because it supports life, and for combustion because it supports burning. Likewise, due to its highly reactive nature, oxygen is used for removal of impurities, welding, in the L-D process for making steel, and in burning of fuels in rockets. Hydrogen is the lightest of all the elements. There is very little hydrogen in the earth's atmosphere. Hydrogen is so light that its molecules are not held by the earth's gravity and they diffuse into space. Overall, it is the most common element in the universe. It is probable that is forms about 90% of the total mass of the universe. It is believed that the sun composes almost of hydrogen and helium. Hydrogen occurs naturally in air as hydrogen gas. It also occurs in combined state in water, acids, petroleum, and natural gas and in almost all organic substances (proteins, carbohydrates, fats, etc.). Hydrogen is most commonly prepared in the laboratory by the action of dilute mineral acids on certain metals. The most convenient way to prepare hydrogen in the laboratory is by addition of dilute hydrochloric acid on zinc granules. Zinc and hydrochloric acid are chosen because they produce the gas at a steady rate. The gas may be collected by downward displacement of water. But when the gas is required free from moisture it is passed through water to remove first, any hydrogen chloride gas and then through concentrated sulphuric acid to remove moisture before being collected by upward delivery. The gas is prepared by upward delivery method because it is lighter than air and is soluble in water. Set up the apparatus as shown in figure bellow. Into a flat-bottomed flask, put some pieces of zinc and add dilute hydrochloric acid by means of a thistle funnel. There is effervescence, and a gas is given off which is collected over water. Zinc chloride, which is formed, dissolves to form zinc chloride solution. A mixture of hydrogen and air explodes with a 'pop' sound when a flame is applied. It is a colourless, tasteless and odourless gas. It is almost insoluble in water (2 volumes of hydrogen gas dissolve in 100 volumes of water at 8ºC). It condenses at -254ºC to a colourless liquid (and liquid hydrogen freezes at -259 ºC to form colourless crystals). It is neutral to litmus. 6. It does not support combustion. 1. It combines easily with other chemical substances at high temperatures. For example, it combines with oxygen to form water. A mixture of the two gases will not react at room temperature. At higher temperatures, or when a flame is applied, the mixture will explode. When hydrogen and oxygen explode, the product is water. Water is just the common name for the substance "hydrogen oxide". 2. Hydrogen acts as a reducing agent, by removing oxygen from some compounds. For example, copper (II) oxide is reduced to copper by heating it in a stream of hydrogen. The hydrogen is oxidized to water. 3. It is neither acidic nor basic, so it a neutral gas. 4. A mixture of hydrogen and oxygen explodes when lit. Put about 5 g of copper (II) oxide in a Pyrex test tube and set up the apparatus as shown in figure bellow. Observe and note the colour of copper (II) oxide before the start of the experiment. What colour is it? By means of a thistle funnel, add hydrochloric acid in a bottle containing zinc metal to generate hydrogen gas. Pass the gas through a U-tube containing a solid drying agent, calcium chloride. Place a dry cobalt (II) chloride paper near the mouth of a test tube as shown in figure bellow. Allow the hydrogen gas to pass through the apparatus for some time in order to displace all the air before lighting it. Heat the copper (II) oxide strongly until no further changes in colour of the cobalt (II) chloride paper takes place. You may repeat the experiment using lead (II) oxide and compare the results. What happens to the copper (II) oxide during the experiment? 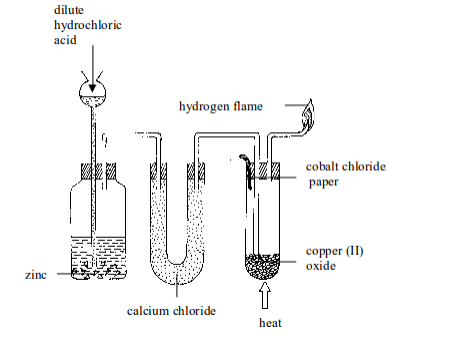 (a) What happens to cobalt (II) chloride paper? (b)Why is it used? (c) What other substance can serve the same purpose as cobalt (II) chloride paper? Enough time should be allowed for all the air in the test tube to be replaced by hydrogen before lighting the gas. What is bad about lighting a mixture of air and hydrogen? What do you think can cause the size of the hydrogen flame to deteriorate? (a) What element did hydrogen take from the copper (II) oxide? (b) Can hydrogen take the same element from any metal oxide? 1. Black copper (II) oxide is reduced by hydrogen to brown copper metal. 2. (a) Cobalt (II) chloride paper changes its colour from blue to pink. (b) The paper is used to indicate that water has been formed in the reaction between copper (II) oxide and hydrogen. This water turns the colour of the paper from blue to pink. (c) The other substance that can be used instead of cobalt (II) chloride paper is white anhydrous copper (II) sulphate, which turns blue when in contact with water. 3. Enough time should be allowed for hydrogen to replace the air in the test-tube because a mixture of hydrogen and oxygen in the tube is explosive when lit. 4. 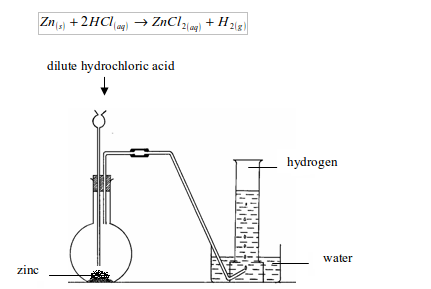 The size of the hydrogen flame deteriorates with time as hydrogen supply grows smaller following complete displacement of hydrogen of the hydrochloric acid with zinc. Deterioration can also be caused by use of excess copper (II) oxide or strong heating, meaning that most hydrogen is used in the reduction of the oxide. (b) No. Hydrogen can only reduce those metals that are below it in the electrochemical (activity) series. 1. It is used in the manufacture of ammonia by the Haber process, which is based on the direct combination of hydrogen and nitrogen. 2. It is used in the hardening of vegetable oils to make margarine. 3. It was formerly used for inflating balloons and air ships. But hydrogen is inflammable and many accidents occurred. Its use has been replaced by helium (another gas occurring in air). Nowadays, hydrogen is used by meteorologists to fill weather balloons, which carry weather instruments that record information on various elements of weather in the upper atmosphere. 4. It is used to prepare water gas, which is used as a fuel for space rockets. When hydrogen contained in water gas is burned in air, it produces extremely high heat energy that is used to power rocket engines. 5. It is used in welding by the atomic hydrogen torch. The complete combustion between hydrogen and oxygen is a highly exothermic reaction and can produce an oxy-hydrogen flame that has a temperature of nearly 2000ºC, and is therefore useful in the welding and cutting of metals. However, the explosive nature of the combustion of hydrogen with oxygen makes the use of oxy-hydrogen flame less favourable than the oxyacetylene flame. 6. It is used in the synthesis of hydrochloric acid. In this case, hydrogen combines directly with chlorine to form hydrogen chloride gas. The hydrogen chloride gas is then dissolved in water to form hydrochloric acid. 7. It is used in the manufacture of methanol (wood spirit). In this process hydrogen combines directly with carbon monoxide. CHEMISTRY FORM TWO ALL TOPICS. CHEMISTRY FORM TWO TOPIC 1 & 2. CHEMISTRY FORM TWO TOPIC 3 & 4. CHEMISTRY FORM TWO TOPIC 5 & 6. CHEMISTRY FORM TWO TOPIC 7. 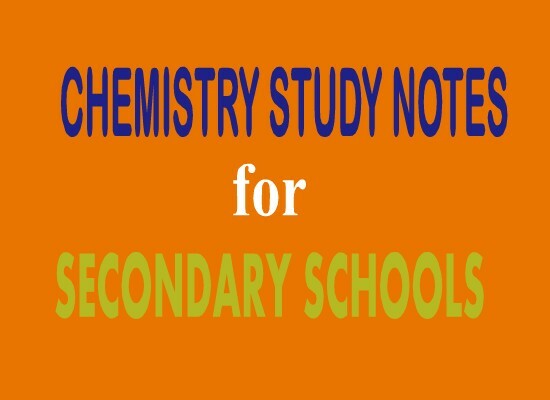 CHEMISTRY STUDY NOTES, FORM FOUR. CHEMISTRY STUDY NOTES, FORM THREE. CHEMISTRY STUDY NOTES, FORM TWO. 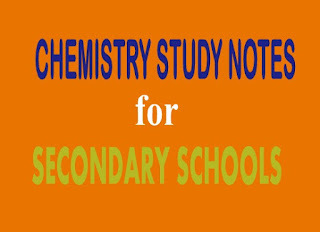 CHEMISTRY STUDY NOTES FORM ONE.